My Ninety burns a lot of fuel, so I'm not using it as much as I should. The Tdi is around 150,000 miles old and giving 26mpg. On 5k miles per year, that's £1200 - so there's not a lot available to spend to make it more efficient - this is for engineering interest and because filling the tank irks me. Looking at smaller engines, it's clear that the Tdi is a torquey beast but more modern designs are catching up. It's possible to use a reasonably simple smaller unit and still give acceptable performance - it'll never be a racing car. I'm idly wondering if a 1.9VAG or 1.9 PSA engine would give my soft-top Defender reasonable performance and 30+ mpg, even through the autobox. I've attached a table of comparisons. Thoughts? Has it been done before? Clearly it'd need adaptors making up, mounts moving etc, but there's plenty of space in a Defender bay and it'll be lighter as well. the 1.9 is a good engine, but in standard form a bit small for the size of car you are trying to move. Im getting 30 mpg, even on simex. I would start with ditching the auto and get the tallest transferbox, and you will achieve exactly what you want. Ps. the VGT you have makes it ideal to have a good lean re-tune. A good service would be a starting point... My 110 returns around 22mpg and does at least 15,000 miles a year so i dunno what your complaining about! Also, land rover now fit a 2.2 engine so that's the sort of size and performance you'd be after if you used a modern engine. For me, the cost of fuel is by far the biggest downside of Defender ownership. I always tell myself it's not too bad as it's offset by carrying out the servicing out myself, the price of parts is relatively low and of course depreciation isn't much of an issue. I must confess though, I sometimes daydream about fitting a small(er) capacity, more efficient engine, something a bit different to reduce the amount of time I spend at the pumps. Surely the actual capacity of an engine with regard to the size/weight of the vehicle it's fitted to is irrelevant? Isn't it the power/torque figures that matter? For example the VW AFN engine's figures in the spreadsheet above aren't too far off the 300Tdi figures so why would this be considered underpowered - would the 4bhp/22ftlb really make all the difference? Or is there another factor that comes into play? The other factor that comes into play is longevity IMHO. Modern car diesels are built to be as 'car-like' as possible, with lightweight parts, smaller bearings for higher speeds. etc. The effect of putting it into something heavy and draggy like a Defender would be similar to using it in it's original home, but towing all the time. It will probably work ok, but life might be shorter and economy may be not all you expect. I'd be looking for engines that were fitted in vans, as a vague guide to how much strength they have in reserve. The Peugeot XUD is a tough little engine though, so it might be OK. There's a guy in the US put a VAG 1.4D into a series as I recall. It occurs to me you could possibly put the XUD lump in easily, using the bell housing and input shaft from a Peugeot powered LDV van, on a 4WD LT77 ? The 1.9pd's are built incredibly well, forged steel crankshaft, fracture-split forged steel connecting rods and Mahle or Alcan pistons. The hand book also states the gross vehicle weight as 2610kg with 2000kg towing limit. so vw are happy to put 4.6 ton behind one so i'd say a defender would be fine. i think the drivetrain losses of a landrover would kill some of the mpg though. Power delivery is important, the tdi's give there ooomph quite low in the rev range. Remember the 2.6 series 3's.... Alot of complaints the engine was to revvy. Agreed. This, coupled with the air resistance characteristics of the vehicle is what will make the most difference. By my calculation comparing to my Tdi 90, you're missing out on 5mpg through your autobox. So if you're serious about fuel economy then going manual will gain you a fair bit, I get 30-32mpg out of mine and that's a hard-top. I don't doubt they are well designed and well built, or that it has the ability to tow... but faced with the choice of two otherwise similar second hand vehicles, I'll most likely buy the one without a towbar. Most of the small diesels I've driven (hire cars) feel like the ECU is artificially holding them back at low rpms. I assume this is to protect either the bottom end or the gearbox from the torque spikes. (or do they just like making their cars drive like ****?) I had a vw small 4wd thing for a week or so, with the DSG gearbox and that was utterly hateful. Good job I didn't pay for the 'zero excess' option or I would have cheerfully crashed it and walked home. What I was thinking, and combine it with a 1.0 transfer box and make sure you never see smoke out of the exhaust, would make things much better. Also, I now have Cruise control on my roadcar, and that makes all the difference in consumption. You think you are driving pretty constant, but you do vary the throttle a lot unintentional. 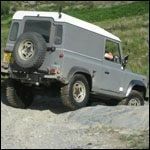 For me, the cost of fuel is by far the biggest downside of Defender vehicle ownership. but the price of fuel nowadays is a serious limit to freedom...no matter what car you drive, IMHO. I'd love to do it with my ex-military 109" IIA. If I had a job again, and lived in a free coutry...I would. To stay on topic, and agreeing with some of the above, I think smaller cc engines would stay with smaller (lighter) cars. Certainly following with interest here! The VAG and other engines such as the volvo ones get some great power figures with a little tweaking. Would be interesting to see the MPG in a defender. I always thought the Audi 2.5tdi would be a great engine to fit, the electronics would put me off though. Or convert if possible to mechanical pumps. I think converting to mechanical pumps would make them work outside they original vehicle, you are going to loose some of the advantage the electronics bring! But you gain what a mechanical pump brings with it... Simplicity! Looking at John's VGT install, I do not think that simplicity is that much of a concern to him! My 300Tdi auto 90, admittedly a hard top not a soft top, will return 30+MPG but mostly at lower speeds. If I drive at 60mph the fuel economy is lower than driving in traffic on A-roads at 50ish. Perhaps it is driving style that is holding fuel economy back? My 1.9PD 104HP VW Transporter is capable of 40+mpg, but get a little more load on it by towing a 1000kg trailer and the fuel economy really plummets. The extra drag on a Landrover transmission may have a similar detrimental impact. John, why not consider cheaper fuels? An SVO conversion or even a full bio-diesel conversion plant at home - they are not very big and can mostly be left to get on with processes unattended or with minimal intervention. I am very impressed with Nick's (Rogue Vogue's). Or just run on veg oil straight into your fuel tank like i do. 97ish pence a litre and no mucking about.